Little man is getting so big. Well, at least big for him. He's actually quite small. 30 inches and 20.5 pounds to be exact. At his last Dr. checkup a few weeks ago, he was in the 5th percentile for height and 11th percentile for weight. Not exactly a giant, but then again, neither are Chris and I. He's not in any danger or anything, he's very healthy, and growing quite nicely on his "growth curve." Meaning that he started out small, and has grown at a consistent pace. So all is well. Despite his small stature, around the house, we can tell that he's getting bigger because now he can reach things that he wasn't able to before. He wants to open doors, pull out drawers, yank things off tables and all sorts of things I am not quite ready for. Aside from his appointments, where he gets weighed and measured, I unofficially track his growth on how hard it is for me to pick him up and how much he can reach. What I realized last week, is that I should also be tracking his growth by marks on his forehead. That kid is now "corner height" on pretty much every table in our house. Luckily he got his mom's hard head and these bumps don't really seem to phase him. Every week it seems that he has a new red mark, scrape or bruise on his forehead. Short of putting a helmet on Hunter, there's not much I can do to protect him until his spacial awareness further develops. 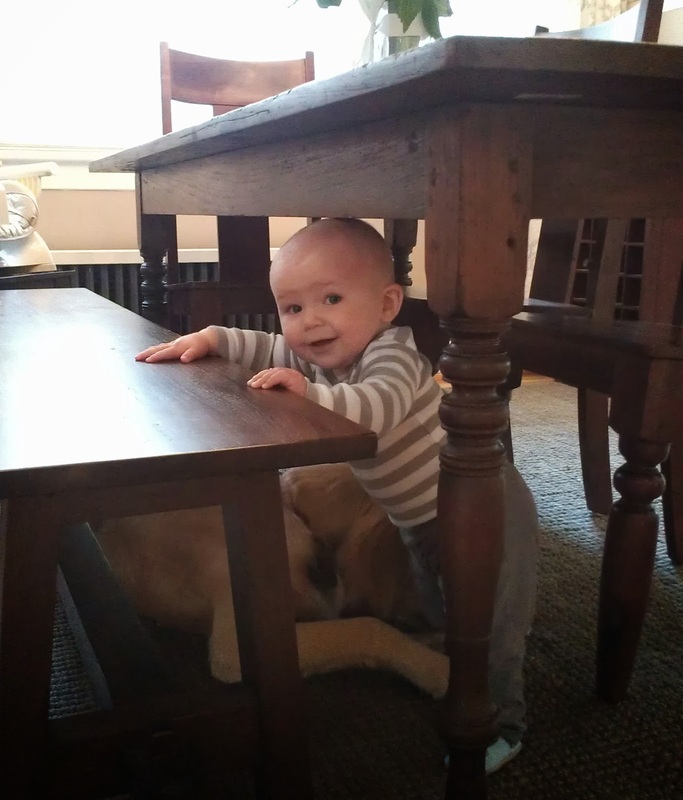 It seemed like a few weeks ago, he was barely walking and could clear the underside of the table no problem. Now, instead of playing under the table, his new favorite game is running around the table and playing hide & seek. So, on a daily basis, this kid is knocking into the corners of the table in his game of "chase me." I'm not quite ready to put him in a bubble, and I'm hoping that he will eventually learn from his missteps, so I made some makeshift "head savers." They say that necessity is the mother of invention...and apparently it's also the mother of hideous home decor. Since, I was literally running out the door to work, I rifled through the junk drawer and found a set of orange shoe laces (why we have these, I have no idea). I tied them tightly around the rags and they at least worked better than the tape. No, in case you were wondering, I couldn't find two matching towels. So, until I figure out a better solution, these dishrags and shoe laces are really classing up the joint....much like the taped up microwave handle (yup, that is still there too). This was one of those silly things that happens all the time around here. It was our nanny who mentioned I had to share this amazing "invention"- pretty sure she meant it sarcastically, but this is the most impressive DIY thing I've done in weeks, so here it is. I know. Impressive is my middle name.